To obtain repeatable and reliable results in preclinical studies based on cow isolated abomasum specimens, it is necessary to confirm the stability of the model in long-term experiments conducted on the day of tissue collection and after cold storage. The experiments were conducted on tissue samples containing abomasum longitudinal and circular smooth muscles that were collected from routinely slaughtered animals. The dose-response curves for acetylcholine and carbachol were determined. The stability of the response of abomasum strips to acetylcholine was verified during long-term incubation and after 24 and 48 h cold storage. The morphological stability of specimens was analysed microscopically after staining with haematoxylin and eosin. Acetylcholine and carbachol generated concentration-dependent contraction of longitudinal and circular abomasal preparations. The reactivity to the reference contractile substance, acetylcholine, was stable through 4.5 h of incubation on the day of tissue collection and after cold storage for 24 or 48 h. The morphology of smooth muscles is only slightly affected after long-term incubation and remains unaffected after 24 h cold storage. The results of the performed study indicate clearly that the model of bovine isolated muscle specimens from abomasum can be a useful tool in preclinical in vitro studies. There are numerous attempts of using bovine gastrointestinal (GI) smooth muscle strips as an alternative in vitro model to study the effect of different factors on motility. Bovine smooth muscle specimens used for those purposes derive from forestomach  abomasum [2-4], duodenum [2,3], jejunum , ileum , caecum  and colon . There are various applications of GI preparations obtained from cows. Abomasal strips are predominantly employed in preclinical studies aimed at understanding the mechanisms of various agents responsible for abomasum displacement and other dysmotilities [9-11]. Furthermore, isolated abomasum preparations are involved in pharmacological investigations in order to determine the effect of endogenous substances [4,8] and xenobiotics [8,12] on their motoric activity. The method of harvesting and preparation of abomasum smooth muscle specimens is well documented and recognized [8,11,13]. The authors agree generally that the motoric activity should be evaluated in respect to circular and longitudinal muscle layers. An analysis of published studies on abomasal smooth muscle preparations reveals that the tissues are mostly obtained from healthy cows routinely slaughtered, shortly after animal stunning. The experiments begin always within max. 2 h after isolation and continue for maximally a couple of hours. However, the exact duration of experiments is usually not mentioned. Some studies included the application of a reference substance at the beginning and / or at the end of the study to control the reactivity of smooth muscle [10,13]. The use of reference substances revealed some differences in abomasum specimens’ reactivity after several hours of incubation  but the authors neither analyzed the reactivity of smooth muscle strips throughout the experiment nor the morphological picture of the tissue. In case of long-lasting experiments it seems reasonable to verify the motoric activity and morphology of incubated smooth muscle strips. According to our knowledge, there are no studies that evaluate fully the usefulness of bovine abomasum strips for performing long-lasting experiments on the day of collection and after storage in a cooled medium. Therefore, the purpose of the study was to assess the time-stability of an alternative model based on freshly isolated and cold stored bovine circular and longitudinal smooth muscle strips. Acetylcholine chloride (ACh), carbachol (CCh), (Sigma Chemicals Co, St. Louis, USA), salts needed for the preparation of the incubation media: NaCl, KCl, CaCl2, NaHCO3, MgSO4, NaH2PO4, glucose and (Avantor Performance Materials, Gliwice, Poland) were used for preparing and conducting the pharmacological experiments. Haematoxylin (Avantor Performance Materials, Gliwice, Poland), eosin and Paraplast plus (Sigma Chemicals Co, St. Louis, USA) were employed for the histopathological examination. Modified Krebs-Henseleit Solution (M K - HS) containing NaCl (123.76 mM), KCl (5 mM), CaCl2 (2.5 mM), MgSO4 (1.156 mM), NaHCO3 (14.5 mM), KH2PO4 (2.75 mM) and glucose (12.5 mM) was employed as an incubation medium in all performed experiments. M K - HS maintained a pH value of 7.35 - 7.45 throughout the long-term experiments, while bubbled continuously with carbogen (95% O2 + 5% CO2) and heated up to 37°C. Acetylcholine chloride and carbachol were dissolved in M K - HS. The experiments were carried out on tissues obtained from adult, healthy dairy cows at a slaughterhouse. Specimens of the abomasal antrum were harvested 20 min - 30 min after the animal was stunned. Whole thickness muscle preparations with the mucosa were taken from the pyloric antrum of the abomasum, approximately 20 cm adoral to the pylorus. Immediately after isolation, the samples were dissected and the omentum was removed. Tissue samples were rinsed and then immersed in the cooled modified Krebs-Henseleit Solution (4°C). Next, the samples were transported (approx. 60 min) to the laboratory. Under laboratory conditions the tissue was gradually warmed up and pinned in a dissecting dish containing the M K - HS. Abomasal mucosa and serosa were removed. The preparations were then cut parallel to the longitudinal muscle fibers (abomasum longitudinal smooth muscle strips - AL) or parallel to the circular fibers (abomasum circular smooth muscle strips - AC). The majority of circular or longitudinal muscular layer was always dissected in order to secure oxygen supply to AL or AC tissue, respectively. The final size of the muscle strips was 5 mm in width and 20 mm - 25 mm in length. In case of experiments carried out 24 h or 48 h after collecting the tissue, the abomasal strips were stored in pre-oxygenated M K - HS at 4°C. Each muscle strip, AC or AL, was suspended in separate organ bath chamber of 5 mL volume each (Organ Schuler Bath, Hugo Sachs Electronik, March-Hugstetten, Germany). The incubation chambers were filled with warm M K - HS and constantly bubbled with carbogen (95% O2 and 5% CO2). The preparations were distally connected to a hook and proximally to an isometric force transducer (F30, type 372, Hugo Sachs Electronik, March-Hugstetten, and Germany). All experiments were carried out under a load of 0.01 N. Isometric transducers were linked up to an analogue-digital registration set (PowerLab, ADInstruments, Sydney, Australia) by a bridge amplifier (DBA, type 660, Hugh Sachs Electronik, March-Hugstetten, Germany). Recordings of isolated AL and AC strips motoric activity were registered by Chart v7.0 program (ADInstruments, Sydney, Australia). All the calculations and analyses were completed by the Chart v8.1.1 program and Excel (MS Office XP Professional). Every experiment was preceded by 75 min of pre-incubation. Throughout the pre-incubation period the chambers were washed out every 15 min - 20 min with fresh, warm M K - HS. The equilibrium included a 45 min period without tension, followed by a period of 15 min with 0.005 N tension and another 15 min of an additional 0.005 N tension. Next, the tissues underwent multiple treatments with acetylcholine (10 μM). If the response of AC and AL to ACh application was repeatable and if the strips exhibited regular spontaneous motoric activity, the preparations were used for further examinations: (i) cumulative dose-response curves for ACh and CCh (0.001 μM – 100 μM) were obtained in separate experiments; (ii) the reactivity of AC and AL strips to ACh (10 μM) application during long-term incubation was evaluated after 1.5 h of incubation in M K - HS and every hour thereafter for the next 4.5 h, the strips were flushed with fresh M K - HS every 15 min - 20 min in-between, the frequency of the spontaneous contractility was measured for 5 minutes after 1.5 h and 4.5 h of incubation in M K - HS; (iii) the reactivity of AC and AL strips to ACh (1 μM and 10 μM) application performed after 1.5 h of incubation in M K - HS was compared on the day of tissue isolation and preparation (1 day), 24 h later (2 day) and 48 h later (3 day). Each individual experiment involved 5-6 tissue strips’ replicates, whereas one animal served as a donor of only one AC and one AL specimen. The registration of smooth muscle activity expressed as changes in the strips’ tension was performed throughout the whole experiment. The effect of all the examined substances was based on changes in the smooth muscle strips’ tension recorded before and after the application of any substance and calculated as AUC (area under the curve). In case of dose-response curves of ACh, CCh for AC and AL all data was expressed in N.s. The response of smooth muscle strips to the application of pure M K - HS in the same volume as the tested substances (50 μL) is expressed as “control”. If the calculated result was positive (values above 0) the reaction was evaluated as contractile, if the result was negative (values below 0) the reaction was assessed as myorelaxant. Whereas, in other cases, i.e., comparison of smooth muscle reactivity during long-term incubation and after 24 h and 48 h storage the results were expressed as the percent of the reaction caused by the reference substance, ACh, applied in the optimal dose (10 μM) at the beginning of the experiment. The contraction provoked by acetylcholine in the reference dose was defined as 100% (control). All data was analyzed using Statistica PL for Windows (v10.0). Results were expressed as mean values ± SD. Values of p ≤ 0.05 were considered to be significant. The following tests were employed in the statistical analysis: t-Student test, a one-way analysis of variance (ANOVA) with post-hoc LSD Fisher test. Abomasal circular and longitudinal smooth muscle strips were collected: (i) straight after preparation; (ii) after 24 of storage in M K - HS (4°C), (iii) at the end of experiment carried out on the 1stor 2nd day. The preparations were fixed in 10% neutral buffered formalin and embedded in paraffin (Paraplast plus), sectioned in rotatory microtome. Preparations of 4 μm in thickness were automatically stained with hematoxylin and eosin (Varistain Gemini Thermo Scientific, Runcom Cheshire, UK). The morphological changes of cell nucleus and cytoplasm including karyolysis or karyopycnosis, nucleus and cytoplasm vacuolisation, and degree of cells structures staining by eosin and haematoxylin, were determined . The microscopic analysis was carried out by light microscope Olympus BX 43 (Olympus Optical, Ltd, Tokyo, Japan) connected to camera computer SC30 and computer program for picture analysis (CellSens Entry 2011, Olympus Optical, Ltd, Tokyo, Japan). The surface of seriously damaged cells was calculated (μm2) and compared to the surface of examined surface of the strip. Final results are expressed as percent of the surface of damaged cells in the strip and represent mean values ± SD. Data was analyzed using Statistica PL for Windows v.10.0 (t-Student test, a one-way analysis of variance (ANOVA) with post-hoc LSD Fisher test were employed). Values of p ≤ 0.05 were considered to be significant. All examined abomasum smooth muscle strips exhibited clear spontaneous activity after 75 min of incubation in M K - HS. The frequency of the spontaneous movements remained stable over the time and after 4.5 h of incubation in M K - HS amounted to 90.18 ± 18.99 and 110.09% ± 22.54% of the frequency measured at the end of the equilibration time for AL and AC, respectively. However, the amplitude of the spontaneous movements dropped off gradually, especially in case of AC specimens. CCh and ACh generated significant contractile reaction of both longitudinal and circular abomasum smooth muscle strips (Figures 1A, 1B and 2). The preparations containing longitudinal muscle fibers reacted generally stronger to the application of both contractile agents than circular fibers. CCh contracted AL and AC if it was used in the concentration range of 0.01 μM - 100 μM and 0.1 μM - 100 μM, respectively. However, there was no statistically significant increase of contraction strength of AL and AC, if CCh was applied in high doses of 1, 10 and 100 μM (Figure 1B). In case of ACh the range of concentration in which the substance induced significant contraction amounted to 0.1 μM - 100 μM and 1 μM - 100 μM for AL and AC, respectively. Although, the evoked reaction was dose-dependent, the force of generated contraction increased gradually and the maximal contraction was observed, if ACh was administered in a concentration of 100 μM and came to 5.96 ± 1.86 and 2.07 ± 0.76 N.s for AL and AC (Figure 1A), respectively. The response of abomasum strips to ACh in a concentration of 10 μM was stable and its force did not change during a few hour long incubation (up to 4.5 h) (Figure 3). In case of AL the force of ACh-generated reaction oscillated between 97.12 ± 8.05 (after 4.5 h) and 106.56% ± 8.88% (after 3.5) of ACh-induced contraction after 1.5 h of incubation. In case of AC the strength of ACh-evoked contraction ranged between 99.37 ± 8.67 (after 4.5 h) and 104.08% ± 9.35% (after 3.5) of ACh-induced reaction after 1.5 h of incubation. Furthermore, AL and AC strips reacted with the same force to ACh (1 μM and 10 μM) application on the 1st, 2nd and 3rd day of experiment (Figures 4A and 4B). There was no statistical difference in contraction strength when tissues were stored cold for 24 h and 48 h.
Figure 1: The response of bovine isolated abomasum longitudinal and circular smooth muscle strips to acetylcholine - ACh (A) and carbachol - CCh (B) application. Figure 2: Sample recordings of the isolated abomasum circular (A and C) and longitudinal (B and D) smooth muscle preparations’ response to the application of acetylcholine and carbachol. F - Flushing with M K - HS, ACh - acetylcholine, CCh - carbachol. Figure 3: The response of bovine isolated abomasum longitudinal and circular smooth muscle strips to acetylcholine (10 μM) application during long-term incubation in M K - HS. 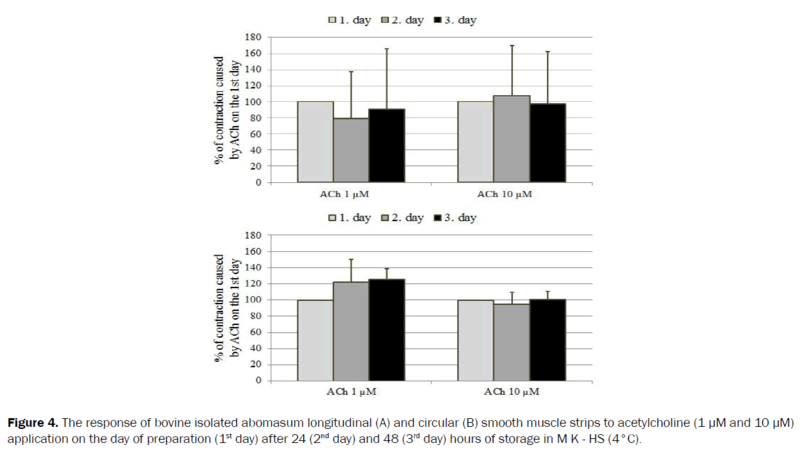 Figure 4: The response of bovine isolated abomasum longitudinal (A) and circular (B) smooth muscle strips to acetylcholine (1 μM and 10 μM) application on the day of preparation (1st day) after 24 (2nd day) and 48 (3rd day) hours of storage in M K - HS (4°C). The results are expressed as changes in strips’ tension (N.s). The response of smooth muscle strips to M K - HS is expressed as a control. The results are expressed as mean of 5-6 independent experiments (± SD), * p ≤ 0.05 vs. control. The results are expressed as % of the contraction caused by acetylcholine on the day of tissue preparation. The results are expressed as mean of 5-6 independent experiments (± SD), * p ≤ 0.05 vs. ACh applied on the 1st day. Abomasum smooth muscle strips examined directly after preparation, 0 h of incubation, on the day of tissue collection from slaughtered cows (control) contained 9.38% ± 7.25% and 8.66% ± 3.00% of visibly damaged cells (apoptotic, necrotic and autolytic cells counted together) for AL and AC, respectively (Table 1 and Figure 5). The 4.5 h incubation of strips collected from the same animals as “control specimens” resulted in a slight but not significant increase of the percent of seriously damaged smooth muscle cells. At the end of long-term incubation in M K - HS the percentage of injured longitudinal smooth muscles came to 14.91% ± 5.87% and in case of circular fibers 15.11% ± 9.21%. The storage of AL and AC preparations in M K - HS at 4°C for 24 h did not result in any remarkable increase in percent of visibly damaged cells when compared to the percent of impaired cells measured on the first day (control). The percent of seriously damaged cells in strips stored for 24 h (4°C, M K - HS) and then incubated for 4.5 h amounted to 15.45% ± 6.60% and 14.20% ± 12.13% in case of AL and AC, respectively (Table 1). Table 1: The effect of tissue manipulation, preparation (day 1, 0 h of incubation), cold storage (day 2, 0 h of incubation) and incubation duration in M K - HS (day 1, 4.5 h of incubation, day 2; 4.5 h of incubation) on abomasal smooth muscle morphology. Figure 5: Sample pictures of abomasum specimen’s morphology (HE staining, obj. magnification 4x). A - abomasum longitudinal smooth muscle specimens: day 1 of experiment, 0 h of incubation in M K - HS; B - abomasum longitudinal smooth muscle specimens: day 2 of experiment, 4.5 h of incubation in M K - HS; C - abomasum circular smooth muscle specimens: day 1 of experiment, 0 h of incubation in M K - HS; D - abomasum circular smooth muscle specimens: day 2 of experiment, 4.5 h of incubation in M K - HS. The results are expressed as percent of the surface of damaged cells (the sum of necrotic, apoptotic and autolytic cells) in the strip. The surface of the whole strip is defined as 100%. The results are expressed as mean of 5-6 independent histopathological examination (± SD), *p ≤ 0.05 vs. control (day 1; 0 h of incubation). This observation is based on the analysis of AL and AC responsiveness to ACh and confirmed by morphological picture of preparations stored for 24 h. Besides, the obtained results indicate that CCh and ACh cause dose-dependent contractions of both AL and AC strips. However, the force of the evoked reaction depends on the applied substance and fiber orientation in the smooth muscle preparation. In general, the study discloses several differences between smooth muscle strips containing longitudinal and circular smooth muscle. In all specimens used in the presented experiments one muscular layer dominated, either longitudinal or circular. A dissection of the majority of the other muscular layer guaranteed proper oxygen supply for the studied tissue . The diffusion of oxygen and nutrients through the gastrointestinal wall is believed to be sufficient only through the first 150 μm layer of cells, basing on the results obtained on cardiac tissue [15,16]. Thus, in order to maintain reasonable conditions the strips used in our study did not contain the full thickness of the muscular layer. Simultaneously, an incomplete dissection of the other smooth muscle layer assured the presence of myenteric plexus which control contractions and relaxations of the GI smooth muscle cells  and ensures the ability of specimens to exhibit spontaneous activity. However, the spontaneous contractility was not identical for AL and AC. The finding that the AC strips were less spontaneously active than AL preparations is in accordance with observations made for sheep abomasum antrum strips . Overall, the obtained results indicate higher reactivity of abomasum preparations of longitudinal orientated muscle fibers than of circular strips. This finding supports previous observations that antrum longitudinal preparations reacted more pronounced to muscarinic agonist application than antrum circular strips . Equal conclusions referring to the higher magnitude of the response to CCh in longitudinal than in circular muscle were stated for jejunum  and proximal loop of colon specimens . In contrary, the contractile effect of bethanechol on circular abomasum specimens was more pronounced when compared to preparations of longitudinal orientation . However, in bovine intestine specimens, the contractile effect of bethanechol was higher in longitudinal than in circular muscle preparations . Higher sensitivity to cholinergic agonists (ACh and CCh) of longitudinal muscle than of circular muscle observed in the study reported here might result from innervation differences. The cholinergic excitatory innervation dominates in both muscle layers of the abomasum, but only the circular muscle receives also inhibitory nitrergic innervation . Muscarinic receptors of M5 type (beside M1, M2 and M3) were detected at the surface of smooth muscle cells in both muscular layers of abomasum and postulated to regulate muscle contraction and relaxation. Since M5 receptors were identified with stronger staining in the longitudinal muscle layer than in the circular one , this could also explain the more pronounced response of AL to muscarinic agonists’ application compared to AC. Less pronounced responses of AC to contractile agents might also be explained by a slightly higher content of smooth muscles that become seriously damaged (in worst case the percentage of injured surface amounted to 30.33%) during long-term incubation in M K - HS (Table 1) if compared to AL. The obtained results display both similarities and differences to data presented by Zulauf et al. . In both studies all employed specimens responded adequately to the reference contractile agent (10 μM ACh or 0.5 μM CCh) after the equilibration period and 3 h after. However, only the data presented herein shows that the strength of the contraction recorded after 4.5 h of incubation in M K - HS does not decrease when compared to the first application of ACh (Figure 3). Interestingly, the constant response to ACh application was confirmed in strips kept in cooled M K - HS (4°C) for 24 h or 48 h. Alike, the frequency of the spontaneous activity of AL and AC measured in our study did not differ throughout the experiment, while Zulauf et al. observed a significant decrease in frequency of contractions over time. Surprisingly, Zulauf et al. did not notice any difference in frequency of contractions between longitudinal and circular specimens, whereas according to the study described herein the frequency of spontaneous contractions as well as the amplitude of the evoked contractions was always much higher in case of AL versus AC. The relative high values of standard deviations obtained herein confirm the observation of the other quoted authors who claim a high degree of variability in contractility patterns of abomasal wall specimens when tissues are obtained from a heterogeneous group of slaughtered animals. Thus, it is postulated to use reference substances in the reference / optimal concentrations in order to relativize the results obtained in the future when using the model of bovine isolated GI smooth muscle preparations. Since, like in other animal species, in cows abomasum contractility is controlled mainly by cholinergic neurotransmission involving muscarinic receptors of subtype M1, M2, M3 and M5 [10,20,21] the selection of a muscarinic agonist like carbachol or acetylcholine as a reference substance is indisputable. In contrast, the criteria set for the selection of the reference concentration should be clearly defined. The optimal concentration should be neither the first nor the last effective dose on a dose-effect curve. It should preserve the ability of smooth muscle to retrieve spontaneous activity; and it should prove reproducibility and repeatability. Taking into consideration the first criterion it seems impossible to select an optimal concentration of CCh, especially in case of circular smooth muscle preparations. Although carbachol generates significant contraction in a wide concentration range, i.e., 0.01 μM - 100 μM and 0.1 μM - 100 μM for AL and AC, respectively, the strips develop tachyphylaxis rapidly. The application of CCh in a dose of 1 μM or higher resulted in contractions of AL and AC, which sizes were comparable (Figure 1B). In case of acetylcholine the increase of used doses caused adequate enhancement of the force of evoked contraction. This observation is in agreement with findings described in the previous study . Thus, the concentration of 10 μM fulfills the first criterion set for a reference concentration for both AL and AC specimens (Figure 1A). Besides, the administration of ACh in a dose of 10 μM induced reproducible and repeatable contraction and all strips treated with ACh in this concentration recovered immediately after flushing with fresh M K - HS. Beside the evaluation of the reactivity, the time-stability of the model of bovine isolated abomasum strips included the analysis of the spontaneous motoric activity. The amplitude of the spontaneous contractility of longitudinal strips remained unaffected throughout long-term incubation in M K - HS but it decreased gradually in case of circular smooth muscle fibers. The frequency of contractions after 4.5 h of incubation was comparable with frequency measured after equilibration period for smooth muscle fibers of both orientations. These findings are again in contrary to previously described studies that reported a decrease in frequency of AL contractions  and an increase in contraction activity of AC  over time. The preserved spontaneous contractility of AL and AC, undisturbed reactivity to ACh (Figures 4A and 4B) and morphological picture (Table 1) of both muscular strips of abomasum after 24 h and 48 h of cooled storage (4°C) in M K - HS does not surprise. As soon as in 1914, Gunn and Underhill observed that rabbit and cat intestinal smooth muscle was still capable of producing rhythmic spontaneous movements and responding to cholinergic and adrenergic stimulation after 5 days of storage in 3°C-7°C . Based on the results gained on guinea-pig isolated taenia caecum, it was assumed that the responsiveness of cholinergic nerves to pharmacological stimuli is resistant to prolonged cold storage . Cold storage up to 50 h did not change the responses of guinea-pig jejunum longitudinal smooth muscle to repetitive stimulation of the membrane . In contrast, canine colon preparations of circular muscle showed reduced duration of slow wave’s duration and diminished response to transmural nerve stimulation after 24 h storage at 4°C . Possibly the differences in specimens contractility after cold storage observed by Sanders and Smith  resulted from the smooth muscle orientation since circular muscle strips are generally found to display less pronounced contractility, as discussed before. Rat isolated oesophageal tunica muscularis strips remained responsive to muscarinic cholinoreceptor stimulation after 48 h of cold storage . Concluding, the results obtained in the presented study indicate clearly that bovine isolated longitudinal and circular muscle specimens from abomasum can be used as an alternative experimental model in physiological and pharmacological studies. The results obtained in experiments that last up to 4.5 h on the day of tissue collection, as well as after 24 h of tissue cold storage (4°C, M K - HS) are repeatable and reliable since the morphological picture and smooth muscle contractility are undisturbed under the described conditions. Besides, 48 h long cold storage of abomasum specimens does not change smooth muscle reactivity. Ohga A andTaneike T. H1- and H2-receptros in the smooth muscle of the ruminant stomach. Br J Pharmacol. 1978;62;333-337. Michel A, et al. In vitro effects of cisapride, metoclopramide and bethanechol on smooth muscle preparations from abomasalantrum and duodenum of dairy cows. J Vet PharmacolTher. 2003;26:413-420. Roussel AJ, et al. Abomasal and duodenal motility in yearling cattle after administration of prokinetic drugs. Am J Vet Res. 1994;55:111–115. Spring C, et al. Modification of spontaneous contractility of smooth muscle preparations from the bovine abomasalantrum by serotonin receptor agonists. J Vet PharmacolThers. 2003;26:377-385. Pfeiffer JBR, et al. In vitro effects of bethanechol on specimens of intestinal smooth muscle obtained from the duodenum and jejunum of healthy dairy cows. Am J Vet Res. 2007;68:313-322. Steiner A, et al. Effect of bethanechol, neostigmine, metoclopramide, and propranolol on myoelectric activity of the ileocecocolic area in cows. Am J Vet Res. 1995;56:1081-1086. Zanolari P, et al. In vitro effects of bethanechol on intestinal smooth muscle preparations in presence and absence of M2 or M3 muscarinic receptor antagonists in healthy dairy cows. DTW DtschTierarztlWochenschr. 2007;114:171-177. Steiner A, et al. Effects of adrenaline, dopamine, serotonin, and different cholinergic agents on smooth muscle preparations from the ansaproximalis coli in cattle: studies in vitro. J Vet Med A. 1992;39:541-547. Geishauser T, et al. In vitro motility disorders associated with displaced abomasum in dairy cows. NeurogastroenterolMotil. 1998;10:395-401. Niederberger MD, et al. In vitro effects of bethanechol on abomasal and duodenal smooth muscle preparations from dairy cows with left displacement of the abomasum and from healthy cows. Vet J. 2010;184:88-94. Turck G and Leonhard-Marek S. Potassium and insulinum affect the contractility of abomasal smooth muscle. J Dairy Sci. 2010;93:3561-3568. Buehler M, et al. In vitro effects of bethanechol on smooth muscle preparations from abomasal fundus, corpus, and antrum of dairy cows. Res Vet Sci. 2008;84:444-451. Zulauf M, et al. Spontaneous in vitro contractile activity of specimens from the abomasal wall of healthy cows and comparison among dairy breeds. Am J Vet Res. 2002;63:1687-1694. Kumar V, et al. Robbins and Cotran Pathologic Basis of Disease. 7th ed. Elsevier Saunders, Philadelphia, USA; 2005. Janse MJ, et al. Techniques and problems in correlating cellular electrophysiology in cardiac nodal tissues. In: Bonke FIM (ed. )The sinus node. 1st ed. Nijhoff, The Hague, Leiden, Netherlands; 1978. Percy WH. In vitro techniques for the study of gastrointestinal motility. In: Gaginella TS (ed.) Handbook of methods in gastrointestinal pharmacology. 1st ed. CRC PressInc., Boca Raton, USA; 1995. Kunze WAA and Furness JB. The enteric nervous system and regulation of intestinal motility. Ann Rev Physiol. 1999;61:117-142. Wong MH and McLeay LM. In vitro spontaneous motility of gastric smooth muscle of the sheep. Q J Exp Physiol. 1988;73:521-531. Pfannkuche H, et al. Cholinergic and noncholinergic innervation of the smooth muscle layers in the bovine abomasum. Anat Rec. 2002;267:70-77. Stoffel MH, et al. Distribution of muscarinic receptor subtypes and interstitial cells of Cajal in the gastrointestinal tract of healthy dairy cows. Am J Vet Res. 2006;67:1992–1997. Steiner A. Modifiers of gastrointestinal motility of cattle. Vet Clin North Am Food AnimPrac. 2003;19:647-660. Hattori K, et al. The effects of cold storage on the adrenergic mechanisms of intestinal smooth muscle. Br J Pharmacol. 1972;46:423-437. Kuriyama H, et al. Nervous factors influencing the membrane activity of intestinal smooth muscle. J Physiol. 1967;191:257-270. Sanders KM and Smith TK. Enteric neural regulation of slow waves in circular muscle of the canine proximal colon. J Physiol. 1986;377:297-313. Akbaralhi H, et al. Effects of cold storage on relaxation responses in the rat oesophageal tunica muscularis mucosae. Can J PhysiolPharmacol. 1987;65:23-29.